When it comes to drug and alcohol abuse, oftentimes people can not recognize that they have a problem and it gets to the point where their loved ones need to step in and intervene. 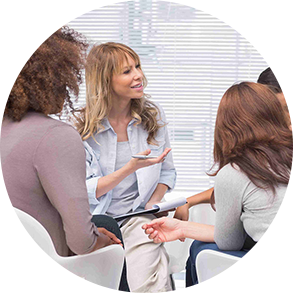 An intervention is a meeting that takes place when an individual is struggling with substance abuse or addiction, and family members or loved ones gather around to encourage the individual to seek help through a treatment center or therapy. This meeting is not meant to attack or scold the addicted individual, but to help them understand that they truly need help and change in their life. An intervention is designed to motivate an individual into treatment. There are many times when someone who is living in active addiction, sees no problems with their lifestyle and they believe that the last thing they need is professional help. It is common for individuals to avoid acknowledging their own problem, requiring their loved ones to step in and show them. It is common for a potential client to have a resistance towards treatment, facing their own faults can be a difficult process so this is why a proper intervention may be needed. An intervention is a time when family members and friends can sit down with the potential client and tell them all the benefits of seeking professional help. Interventions can be used for those struggling with alcohol addiction, substance abuse, eating disorders, gambling, or any other addictive behaviors and at Banyan Detox in Stuart, we strongly encourage interventions when an individual is not realizing the damage that has been done. An intervention presents a structured opportunity for the person struggling with addiction to seek help and take that first step towards healthy change. It is not uncommon for the use of an ultimatum when facing resistance from the addicted individual. They may be thrown off guard and become very defensive by completely denying the addiction or that they have a problem. During an intervention, many families use an expert to help guide the meeting and make sure things run smoothly. Once an intervention is properly executed, treatment is the next step. At Banyan Detox Center, we offer numerous unique programs and therapies for all kinds of addictions and our treatment is truly customized and designed to meet the needs of each client. A successful intervention can lead to the addicted individual seeking immediate help for their problem and this is a step in the right direction. Recovery often begins at the intervention phase and this meeting may be the spark that the individual needed to seek help. Our drug and alcohol detox center in Stuart is here to help you through your addiction struggles and we guide you every step of the way. It’s never too late to make a change in your life and get clean. We understand how scary addiction can be and we want to help you regain control over your life. Learn more about the different treatment methods we offer at Banyan Detox Center. Please call 888-260-0029 to speak to an intervention specialist.